Cancer patient gift ideas are notoriously difficult to locate. You want to express your wishes, and lend the patient strength, hope and courage. While it's not what you give, it's the thought that counts... What if there were a gift you could give that was both a thought and something special? When a sentiment is hard to put into words on your own, Captured Wishes is there to help. Our cancer patient support Wish vessel is perfect for your needs. Comes complete in custom packaging, and ready to gift. This beautiful Captured Wish (height approx 30mm x 15mm width) vessel is a perfect cancer patient gift idea. 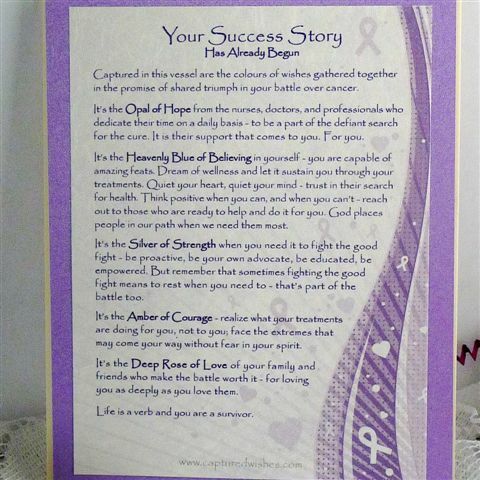 It expresses the need for hope, strength, belief and courage, and the love you feel for the cancer sufferer. Every element of the gift package has been designed with loving care. Your gift recipient will be truly touched when they open it. You need never worry that your friend or family member will not understand your sentiment. Most of us have a hard time expressing ourselves in difficult times, and that's where the Captured Wish will be a perfect source of strength for both of you.